Golf R and Scirocco R on sale | What Car? Volkswagen has announced prices and specifications for its most powerful-ever versions of the Golf and Scirocco. Prices start at 26,945 for the Scirocco R and 28,930 for the Golf R. Choosing a six-speed DSG semi-auto gearbox adds 1300 to both models. With a 261bhp 2.0-litre TSI engine and standard six-speed manual gearbox, the Scirocco R hits 62mph in 6.0 seconds, or 5.8 seconds with the DSG gearbox. Average fuel consumption is 34.9mpg (35.3mpg with the DSG 'box) and the engine emits 189g/km of carbon dioxide. For the first time on an 'R' model, the power is channelled through the front wheels, while a traction control system improves grip whatever the road conditions. In the Golf R, the 2.0-litre engine is tuned to produce 266bhp. The Golf covers the 0-62mph sprint in just 5.7 seconds (5.5 seconds with the DSG 'box), making it the fastest-accelerating Volkswagen ever produced. It still manages 33.3mpg on average, (33.6 with the DSG 'box) and emits 199g/km of CO2. The Golf R is available with three or five doors, and uses a new, quicker-reacting version of VW's 4Motion four-wheel-drive system, which maximises traction and reduces wheelspin. Unique styling on the R models include new front bumpers with LED daytime-running lights and three deep air dams, xenon lights, plus gloss black grille parts and wing mirrors and sill extensions. The 18-inch five-spoke Talladega alloy wheels house gloss black 'R' brake calipers. Optional 19-inch wheels are also available, and on the Golf R these can be specified in gloss black. Both models have twin-exit exhausts and rear roof-mounted spoilers, as well as smoked rear light units. Styling changes inside include new sports seats with 'R' logos, a three-spoke black leather sports steering wheel with contrasting stitching, and new white backlit dials with electric blue needles. The Golf R is available with Recaro bucket seats. 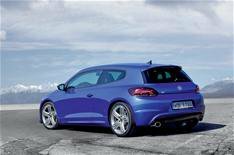 Power in the standard 2.0-litre TSI Scirocco GT has been increased by 10bhp to 207bhp. This cuts 0.3 seconds off the 0-62mph sprint time and increases the top speed to 149mph. Fuel consumption has improved, from 37.2mpg to 38.2mpg, and CO2 emissions have been reduced by 7g/km to 172g/km. • Check back for our first drive of the VW Scirocco R on November 4.